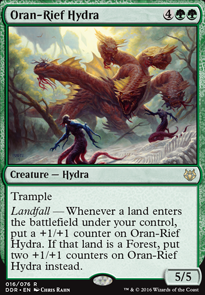 Landfall --- Whenever a land enters the battlefield under your control, put a +1/+1 counter on Oran-Rief Hydra. 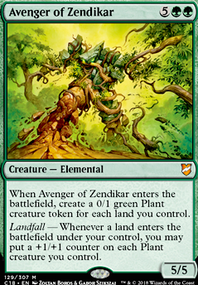 If that land is a forest, put two +1/+1 counters on Oran-Rief Hydra instead. One thing to note: see how as we add more cards a mana curve naturally starts to form? That happens just about every deck. I try to maintain the curve that forms unless I have a reason to adjust it. So we'll be cutting cards that disrupt the curve. For example, at this moment we would want to cut cards that cost 6 cmc. But we're not done. blakeivey12 on Grandma, what big teeth you have.. I think you'd want to focus on proliferate and putting +1/+1 counters on your creatures. I think that you have a larger number of enchantments then you need. Here are my suggestions to sharpen this area of your deck. Web of Inertia should be replaced with Inexorable Tide . Sheltered Aerie can be replaced with Hardened Scales . This next swab can be a large chunk of money but is a significant upgrade. Asceticism is an upgrade for Shielding Plax . It is up to you but I would cut Beastmaster Ascension and Bred for the Hunt . You can replace them with value creatures that allow you to utilize your commander. For Sorcery, I am going to again focus on proliferate. Miming Slime creates a creature who can be powerful but not of value, instead I would put in Tezzeret's Gambit . 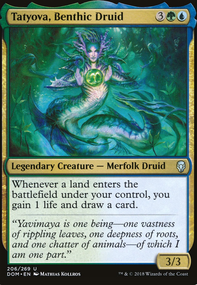 Verdant Confluence is a good card but beings with it a high mana cost. 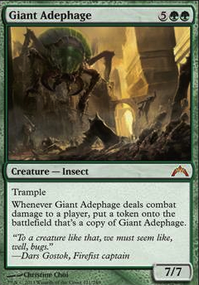 Triumph of the Hordes is cheaper, buffs all your creatures, and threatens your opponents with an infect trample attack. I would replace Confluence with the Triumph of the Hordes card. Cultivate could be more versatile and cheaper then Journey of Discovery . Now instants. Druid's Deliverance focuses on populate. This ability is for doubling tokens and not counters. Krosan Grip is more value as you get to remove a target artifact or enchantment. Your other cards are good choices but preventing combat damage just slows you down. I would remove Respite and Root Snare . 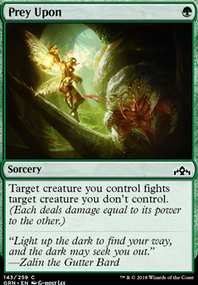 You can use this spot to add 2 more creatures that will buff your experience counters. Artifacts is really up to you. My only suggestion would be to remove Simic Keyrune and put in Whispersilk Cloak . Lands look great! Some suggestions would be Yavimaya Coast , Temple of Mystery , Evolving Wilds or Terramorphic Expanse , Botanical Sanctum , and Hinterland Harbor . Sand Silos can slow you down somewhat and Darksteel Citadel only produces colorless mana. It is up to you on how you want to combine these suggestions. My last note is that your land count should be between 37 and 39 to make sure you can constantly play mana and don't get stuck. 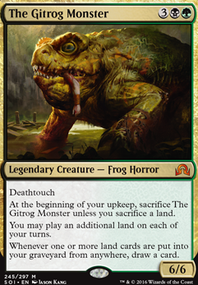 Creatures are the bread and butter of your deck. You need them for those experience counters, so let's start putting in some value creatures that benefit you. Wall of Mist is a defender that will never attack, instead lets try to put in Chasm Skulker . Skulker can get very scary and when he is removed, you have an army of tokens. Cultivator of Blades can help to power up your creatures on an attack, triggers an experience counter, and is cheaper in mana then Oran-Rief Hydra . Druid of the Cowl can be upgraded with Gyre Sage . Sakura-Tribe Scout and Wayward Swordtooth allow you to play additional lands but this doesn't benefit your gameplan. Herald of Secret Streams and Champion of Lambholt are good value cards to replace them. Gladehart Cavalry is very expensive mana wise. 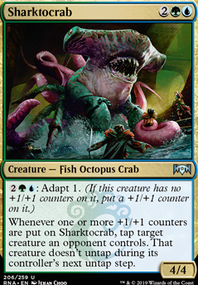 Vorel of the Hull Clade is a great replacement that doubles your counters. Overgrown Armasaur should be replaced with Managorger Hydra . Lord_Europa on That Azusa deck with 69 ( ͡° ͜ʖ ͡°) basic forests. 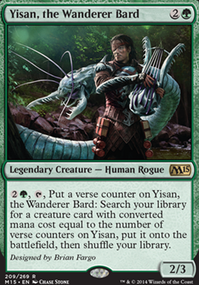 Is Oran-Rief Hydra not worth it? chickenekcihc on Mana flooding is a good thing?!? !